Historically, crossbows have featured in many of the wars that have shaped modern Europe, much more so than the longbows favoured by English soldiers in the same late Medieval centuries. 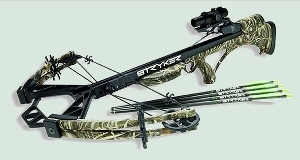 Modern-day crossbows have been developed into sophisticated and powerful implements that can be fitted with telescopic, or even laser, sighting and used as a substitute for a rifle. Highly accurate over short distances, they are still used by some military special forces units such as Spain's elite Green Berets. Rather than holding the drawn bowstring directly, the user operates a trigger to release the cord and send a heavy bolt on its way to the target. Crossbows are generally heavier than bows but, because the user doesn't have to hold and control the force of the drawn string, a steady aim can be held more easily. As with air weapons, the very low degree of physical strength required makes crossbows an excellent option for young, older or disabled guests. Anyone can have a go, and our staff will be on hand to help make sure they can really enjoy doing so. As with all the activities we offer, well-maintained equipment, a plentiful supply of targets and projectiles, proper safety supervision and experienced instructors come as part of the deal.